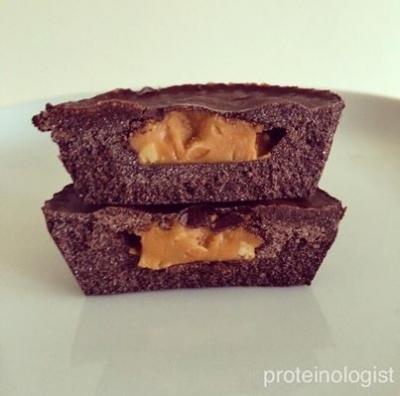 Protein almond butter cups made with Barney Butter's crunchy almond butter. Melt the coconut oil in the microwave and mix in the the cacao powder and honey. Then mix in the chocolate whey. Pour half of the batter into 4 silicone cup moulds. Freeze for 5 minutes. Add a heaping 1/2 tsp crunchy almond butter to the centre of each and top each cup with the remaining chocolate batter. Freeze for another 5 minutes or keep frozen until needed.